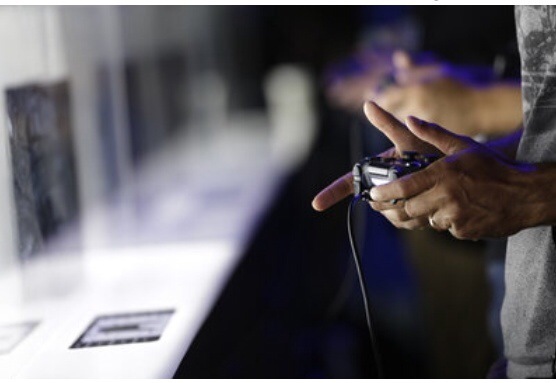 Attendees play video games on a PlayStation 4 at the Sony booth during the Electronic Entertainment Expo in Los Angeles. A study by the Centers for Disease Control and Prevention released Thursday found a surge in number of kids who spent three or more hours on an average school day on screened electronics other than TV. NEW YORK — American teens are smoking less, drinking less and fighting less. But they’re texting behind the wheel and spending a lot of time on video games and computers, according to the government’s latest study of worrisome behavior. “Overall, young people have more healthy behaviors than they did 20 years ago,” said Dr. Stephanie Zaza, who oversees the study at the Centers for Disease Control and Prevention. Fewer than 16 percent of the teens smoked a cigarette in the previous month — the lowest level since the government started doing the survey, when the rate was more than 27 percent. Another CDC study had already put the teen smoking rate below 16 percent, but experts tend to treat this survey’s result as the official number. It’s “terrific news for America’s health,” said Matt Myers, president of the Campaign for Tobacco-Free Kids. Even so, there are still about 2.7 million teens smoking, he said. Among teen drivers, 41 percent had texted or emailed behind the wheel in the previous month. That figure can’t be compared to the 2011 survey, though, because the CDC changed the question this time. The latest survey gives texting-while-driving figures for 37 states — ranging from 32 percent in Massachusetts to 61 percent in South Dakota. Although video-gaming is up, particularly among teen boys, some researchers believe most of the screen time increase is due to social media use. And it’s probably not a good thing, they say. Through texts and social media, young people are doing more communicating and living in an online world in which it’s easier to think they’re the center of the universe, said Marina Krcmar, a Wake Forest University professor who studies teen screen time. That can lead to a form of extended adolescence, she said. Fighting may be down, but it’s not uncommon, according to some teens at the High School of Fashion Industries in lower Manhattan. Two students said they saw roughly one fight a week. “It’s like ‘The Hunger Games,’” said 14-year-old Maya Scott. She said she had been in a fight during the current school year. A few minutes later, as if to prove her point, three girls exchanged words and nearly came to blows outside the front entrance before a school lunch worker stepped in and separated them. MIAMI HEAT ACTIN A FOOL!!! !